There’s been a shift in my process and style. I’ve exchanged my brushes and technique of action painting for pallet knives and trowels that have lead me down a road of sgraffito and frottage created within the textural layers of the work. Although the process now is slightly more considered, I never fully know where the work will take me as intuitive marks and expressive gestural forms are laid down and worked into. My aim is to exude an energy or strength within the work that clearly links back to the process and inspiration for the piece and if it ignites a spark within the viewer then I’ve done my job. Place, memory and experience all inform the work, I am not replicating, but merely eluding to, through the visual language. Donna Louise Fletcher is an Abstract Expressionist painter working from her home studio on the Central Coast of NSW. Donna studied at The University of Newcastle 2005 – 2008 and graduated with a Bachelor of Fine Art. It was during these academic years that her skill of intuitive mark making emerged and she has spent the past decade experimenting, developing and fine tuning her technique. 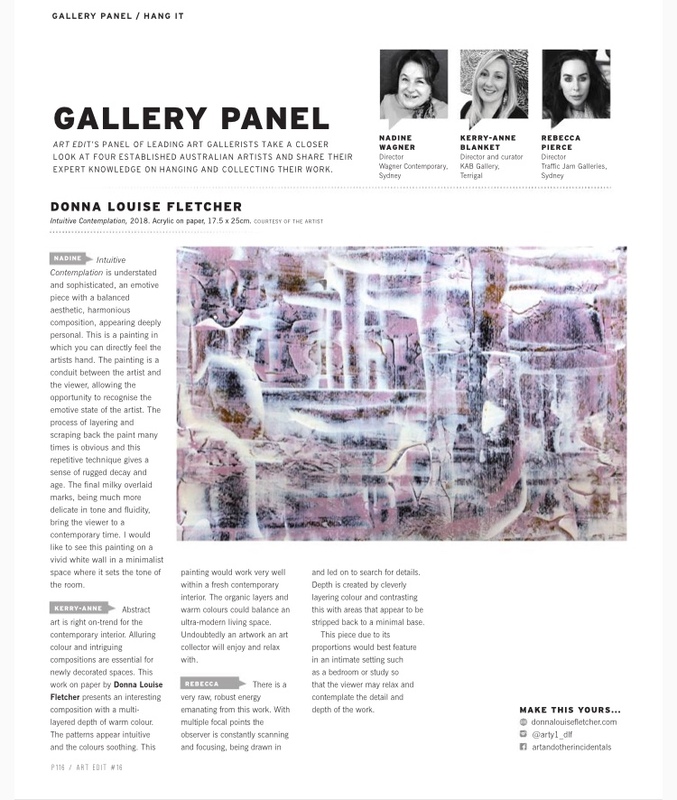 Donna has exhibited frequently in both solo and group exhibitions in New South Wales and Victoria since 2006 and in 2018 in London at the exclusive La Galleria, Pall Mall. Donna also sat on the committee for the Gosford Regional Gallery and Arts Centre as a community representative, 2013 - 2016.